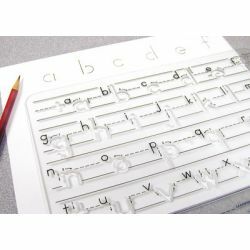 These handwriting instruction guides feature 1" letters on an 8 1⁄2" x 11" template and include sample letters for identification numbered stroke sequence and arrows showing proper stroke direction. Ruled lines illustrate correct letter proportion, spacing and placement. Ages 4-7.